(FinalCall.com) - The dirtiest thing about the South is not the “Dirty South” music genre, but institutional racism that shatters dreams and destroys families. For the Scott Sisters, who supporters say were unfairly sentenced to life in prison 16 years ago, it has meant watching their children grow into adults and mourning the loss of their father. Since October 1994, Gladys and Jamie Scott have been serving two life terms each in prison, convicted of an $11 robbery. 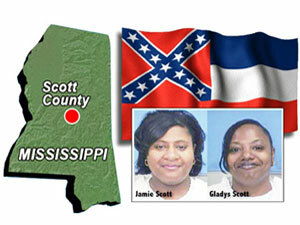 The Scott Sisters had never been in trouble with the law, but on December 24, 1993, the Scott County Sheriff's Department in Mississippi arrested the Black women for an armed robbery where no one was murdered, injured or even taken to the hospital. Gladys and Jamie, then 19-years- and 22-years-old have always maintained their innocence. This case represents a complete miscarriage of justice, say friends, family members and a growing number of supporters. Three teenagers, all related and aged between 14 and 18, confessed to the robbery. In the initial complaint filed shortly after the robbery, the victims did not mention the Scott Sisters' alleged involvement in the crime. But the three teens agreed to a plea bargain that included implicating the two girls. The boys received 10 months in jail while the Scott Sisters, who were never offered a plea bargain, were sentenced to two life terms each. “Even one of the alleged victims testified in court that Jamie and Gladys never robbed them, never took anything from them and that the three boys did, but that he believed that Jamie and Gladys told them to do it,” said Evelyn Rasco, the Scott Sisters' mother during an exclusive interview with The Final Call. There was never any physical evidence entered into the trial and it was an all-White jury, she noted. “No justice was given to them at all. It was a circus court. This is wrong. They have nine children and four grandchildren; oldest grandchild is seven-years-old,” said the mother. Testimony from the Black youth reveals that coercions, threats and promises led to naming the Scott Sisters as the robbers. The 14-year-old testified that he signed a written statement without an attorney present. The teen was told that he would be sent up to Parchman Farm—the notorious Mississippi penitentiary—if he did not cooperate. In addition, he was told that he would be “made out of a woman” (raped by men) at Parchman. In 1998 one of the sentenced teens signed an affidavit maintaining the sisters were not involved with the crime. The injustice stems from not only racism, but a vendetta against the family because of Scott Sisters' outspoken late father and another family member, explained Mrs. Rasco. The nephew of James “Hawk” Rasco, the father of the Scott Sisters, implicated a White sheriff who was extorting Black night club owners which resulted in the sheriff serving time in prison, she said. The night club owners had been paying approximately $100 per week to sell alcohol in Scott County, which was a dry county. Mr. Rasco who had recently moved to Mississippi from Chicago bought the night club from the nephew. According to the mother, a Black deputy felt her husband should continue paying bribe monies that the nephew paid. Supporters say when Mr. Rasco refused the deputy responded, “I will get you, even if it is through your daughters.” Mr. Rasco died in February 2003 from a heart attack. Mrs. Rasco has never given up hope. She has written letters, made phone calls and told everyone who would listen about her daughters' plight. She caught the attention of Nancy Lockhart, a legal representative and community organizer who was working at the Rainbow PUSH Coalition. The Scott Sisters have exhausted all their legal remedies. Every attempt by the Scott Sisters to challenge their convictions has been denied. Jamie Scott is currently represented by Attorney Chokwe Lumumba for her medical issues only. Both Jamie and Gladys are in need of criminal lawyers to review their cases and determine a course of action, according to their mother. The fight to free the sisters is now heightened by Jamie's worsening health condition. “Jamie is deteriorating every day,” said Mrs. Rasco. In January, 2010, Jamie Scott suffered failure of both kidneys. “The medical diary of Jamie Scott is very extensive and depicts inhumane treatment, torture and the lack of appropriate medical care,” said Ms. Lockhart. From March 15, 2010, to approximately March 25, 2010, Jamie was hospitalized where attempts were made to eradicate severe infection and surgically implant a fistula into her arm for dialysis. She has no usage of that arm to date and continues to battle infections. One of the doctors stated that infection had spread throughout her body, say supporters. Her sister Gladys wants to donate a kidney to her sister. The Scott Sisters' cry for justice has been heard by the Gray-Haired Witnesses for Justice, a group of “elder” activists who plan to fast and travel to the White House on June 21 to urge the federal government to “exercise an authentic system of justice for Gladys and Jamie Scott and all other women who have been incarcerated wrongly and egregiously over-sentenced,” said spokeswoman B.J. Janice Peak-Graham. The Gray-Haired Witnesses for Justice have demanded freedom for the Scott Sisters and they want an inspection and observation team to enter the Pearl, Miss., prison where Jamie Scott is being held. During the day-long upcoming demonstration, supporters will make a formal appeal to Attorney General Eric Holder and President Barack Obama.